How to watch Cirque du Freak: The Vampire's Assistant (2009) on Netflix Singapore! 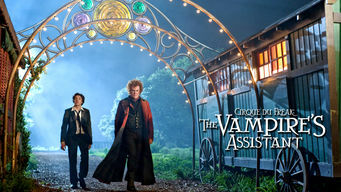 Yes, Cirque du Freak: The Vampire's Assistant is now available on Singaporean Netflix. It arrived for online streaming on October 16, 2018. We'll keep checking Netflix Singapore for Cirque du Freak: The Vampire's Assistant, and this page will be updated with any changes. When Darren Shan is taken to a circus that's chock-full of sideshow oddities, he meets a vampire and receives a life-changing bite on the neck. Teen geeks meet carny freaks led by bloodsuckers and bearded ladies. Don't get too close, you might just join the show.